Home › Home and Kitchen › Pancake Batter Dispenser - Kpkitchen Easy Pour Home Kitchen Gadgets - Perfect..
Pancake Batter Dispenser - Kpkitchen Easy Pour Home Kitchen Gadgets - Perfect..
BATTER UP! - KPKitchen proudly presents to you our durable and reliable Pancake Batter Dispenser! Made entirely of high quality plastic, this easy to use baking tool is designed with a wide mouth opening making filling it up a breeze, and the quick close valve makes pouring the perfect pancake like a pro seem like child's play! SQUEEZE ME - Our redesigned pulley handle has been repositioned to ensure quality and durability. In short, IT WON'T BREAK! So squeeze away, pancake after pancake. Not to mention, our fail safe valve doesn't leak, leaving your hands and kitchen clean, and making it safe to use by your little kids. Best of all, it's 12 inch wide, allowing for chunky muffin mix and small chocolate chips to slide through easy breezy. PORTION CONTROLLED - Lopsided pancake stacks.... The struggle is real. Keeping a consistent size for your pancakes and other baked goods can be a hassle to the untrained eye, but now, just squeeze and go with our food dispenser. Just pull the handle, count to two, and move on. It's as simple as that! DISPENSING USEFULNESS - Waffles, muffins, cake mix, and even pizza sauce: all fit perfectly through our dispensing valve, offering you the versatility to use your imagination and be in control of your mixes. If the batter is too thick, just add a bit of extra liquid and it will work perfectly. Who knew that something so simple would end up being so useful? SERVICE WITH A SMILE - We pride ourselves on that. We want you to know that you matter to us here at KPKitchen. That's why we make sure you buy stress free with our LIFETIME GUARANTEE! We have even included a FREE Cupcakes & Pancakes Recipes eBook as a BONUS just for YOU! If the product isn't for you, we'll refund your purchase. If you need a replacement, it's already on the way. Plus, you can keep your recipes eBook as our way of saying thanks for trusting us. YOU are our number one priority! YOU'VE GOT 99 PROBLEMS AND A PANCAKE's ONE... More than one, actually. You've successfully created a plate full of fluffysnowflake-like breakfast food. From the battery mess around the stove, itlooks like you could have made a few more pancakes than you already have... STAY CLEAN, AND STAY EFFICIENT! Nobody likes to clean up batter, and with KPKitchen you won't have to! Simplypour in your batter of choice and you're well on your way to creatingperfectly portioned baked goods in no time. WHATEVER YOU LIKE From Pancakes to Cupcakes and beyond! You can use our amazing food dispenserto dispense waffles, muffin mix, cake, and even pizza sauce. Who knows, maybeyou'll even find more ways to use this versatile kitchen appliance in yourhome! GUARANTEED GOODNESS Don't forget, we've got your back for a lifetime. Whether it be a replacement,or a refund, you just let us know. We're here for you, and your satisfactionis all that matters. And if you order today we have a special bonus just for you: The FREE eBook includes 7 delicious Cupcakes & Pancakes Recipes. 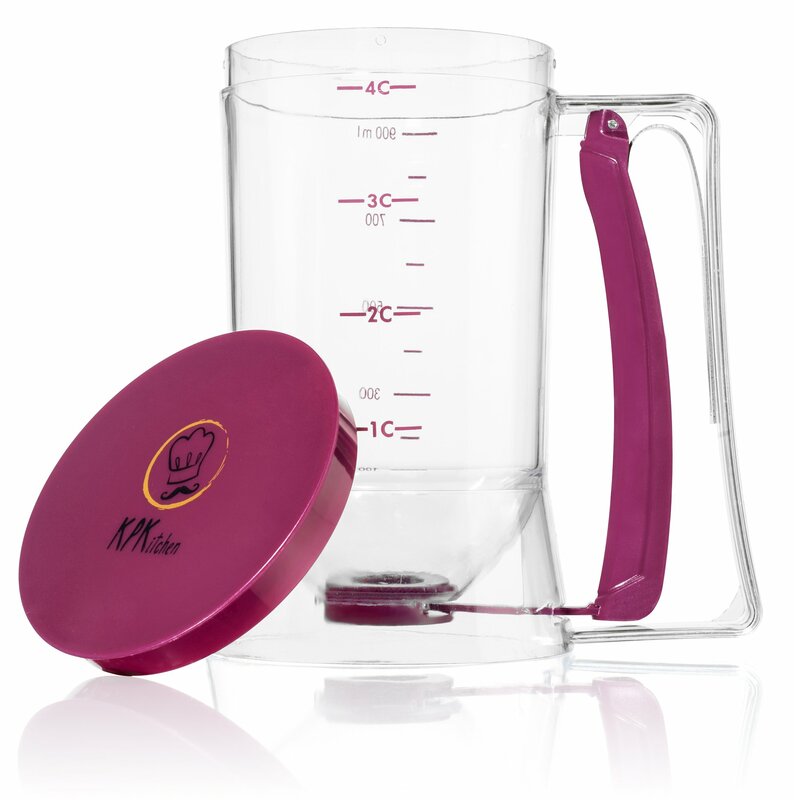 Get it sent to your email FREE just for ordering the KPKitchen Pancake Batter Dispenser. WHAT ARE YOU WAITING FOR? BAKE AND CAKE BETTER WITH KPKITCHEN AND CLICK THE "ADD TO CART" BUTTON NOW! !